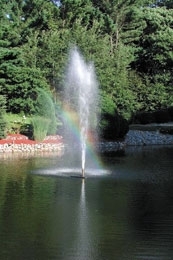 Creates an exciting, geyser type vertical column of water in a highly-visible, wind-resistant dense pattern. The stream of cascading water reaches heights of up to 15' on the 1/2-HP model (25' on the 1.5HP model). Frothy, highly-aerated stream is both aesthetically pleasing and maintains water clarity.